A 'Fanfare' is a a short ceremonial tune or flourish played on brass instruments, usually to introduce something or someone important. 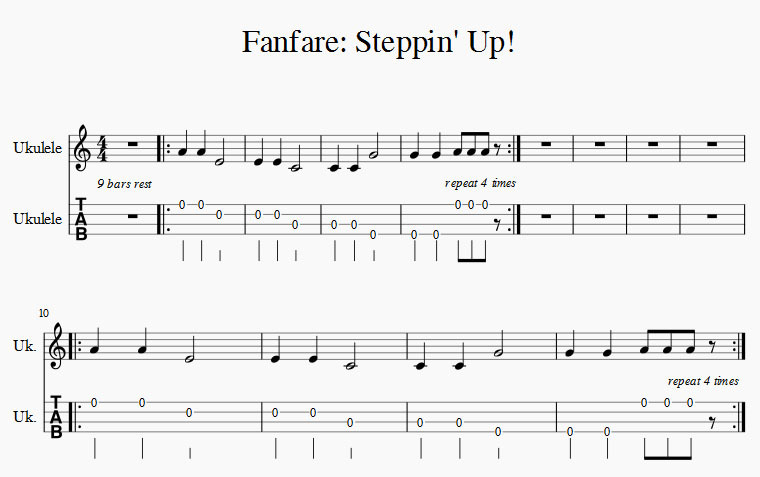 Our fanfare starts on the bottom string (A) and uses the same rhythm pattern at first "short short lo-ong"
Play the above pattern 4 times in time with the backing track, then there is a break of 4 bars then repeat till the end! You may recognise some of these chords if you've learned the 'Teachers' parts to the other beginner pieces? The strumming (playing) pattern for this piece is a little different to before though...count carefully!